Self cater parties are another way to personalise your child’s party, i.e. Chocolate Fountains, Themed Table decorations, Themed Food etc. 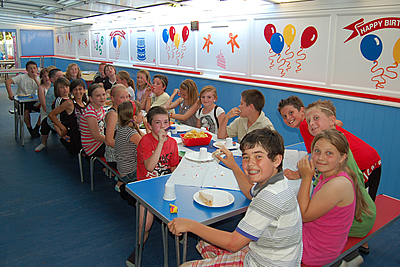 The children get all the use of the play facilities but when it comes to the party meal, you take control. Members always pay £1 less per child. Take a look at our Membership page for full details and prices and further membership promotions and discounts. Please call 01424 423778 to become a member to get this discount. Lines open 9.30am - 5.30pm, 7 days a week. There is an option for Balloon and Popcorn on the booking screen. This is for each child to take away when they leave. For this there is a charge of £1.75 per child. There is also an option for party bags on the booking screen. This is for each child to choose a gift from our retail wall when they leave. There is a charge of £2 per child. - Early booking advised for weekends. Week days From £7.50 per child.